Sucinta Bhikkhuni was born in Germany and was raised in a Catholic family. She earned University degrees in Psychology and Education, and conducted historical research on children during the German Nazi Regime. She encountered Buddhism in Germany during her training in Psychotherapy with a psychiatrist who was a Buddhist. She traveled to Sri Lanka and meditated on Parappuduwa Nuns’ Island, a center founded by Ayya Khema. Then in 1991 she went forth and took ‘anagarika’ or 8 precepts at Amaravati Buddhist Monastery in England. She traveled onward to the USA to study as a Samaneri at the Bhavana Society in West Virginia with Sri Lankan Bhikkhu Henepola Gunaratana Nayaka Thera. She translated his book Mindfulness in Plain English, into German. In 1998, Sucinta Bhikkhuni received higher ordination at the international higher ordination ceremony held in Bodhgaya, India. She was the only Western novice and thus became one of the first modern Bhikkhunis of the Theravada tradition. She spent several years meditating in Myanmar at Yektha Mahasi Center, Pha Auk and Swe-Oo-Minh Tawya Teiktha. She studied at the International Theravada Missionary University in Yangon, and at the Sitagu International Buddhist Academy in Sagaing Hills. At these institutions she also met Taiwanese and Korean Bhikkhunis. 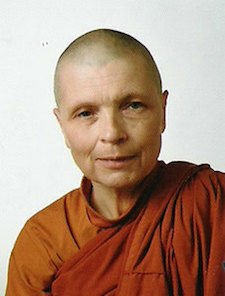 Then she sojourned to Sri Lanka and studied at the Sakyadhita Training Center, and it was there in 2004 that she received an invitation to the USA to establish a temple in South Carolina with American-Bhikkhuni Sudhamma serving the Sri Lankan community in the USA , as well as Christians and other backgrounds. Her dream is to one day establish a temple for Bhikkhunis in Germany. She is committed to internationally supporting women’s higher ordination.